Yesterday’s signals were not triggered, as there was no bearish price action at 0.6802. Trades may only be taken from 8am New York time Wednesday to 5pm Tokyo time Thursday. Short entry following bearish price action on the H1 time frame immediately upon the next touch of 0.6871. Long entry following bullish price action on the H1 time frame immediately upon the next touch of 0.6802. I wrote yesterday that the price was likely to consolidate until the key central bank releases from the RBNZ due later which were likely to cause higher volatility, and which could easily push the price in any direction, so I had no directional bias. 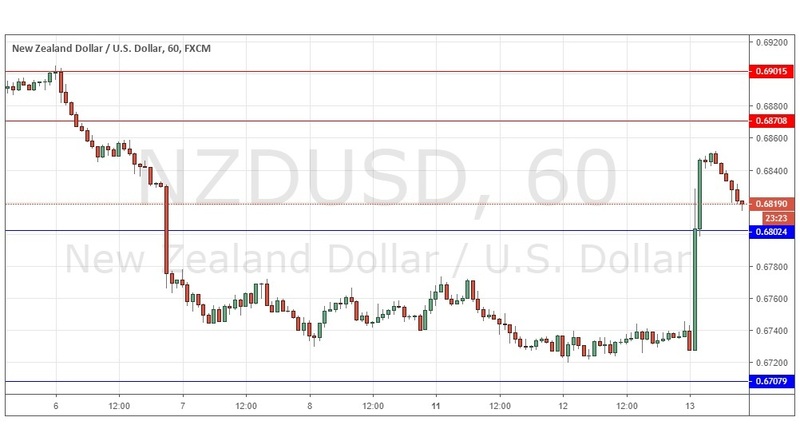 This was a good call, and the RBNZ sent the price up in a strong and fast move which easily broke the resistance level at 0.6802 which is likely to now become new support. If it holds when it is reached, or if the price bottoms out from the current bearish retracement just above that level, the odds would be with the bulls at that point. If the price gets established below 0.6800 later, it is likely to drift down to at least the 0.6750 area. Regarding the USD, there will be a release of CPI data at 1:30pm London time. Concerning the NZD, the Governor of the RBNZ will be testifying before Parliament at 7:10pm.